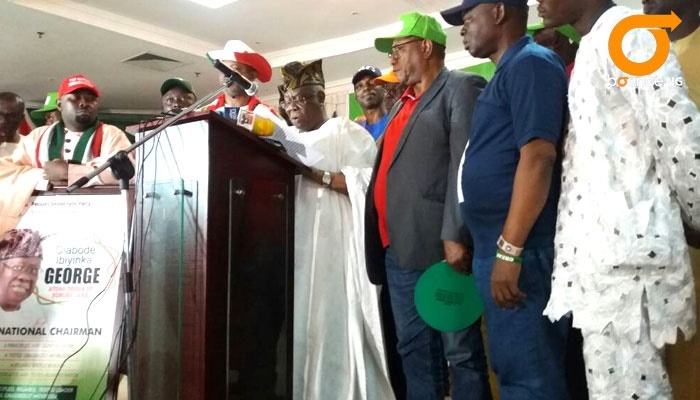 The Lagos State Chapter of the PDP has backed the candidacy of Olabode George for the National Chairmanship position during the forthcoming December 9 National Convention of the party. If the Lagos Chapter of the People's Democratic Party (PDP) were the only chapter saddled with the sole responsibility of appointing a national chairman for the PDP, Bode George would be chairman. The chapter on Sunday endorsed the candidacy of Olabode George for the National Chairmanship position during the forthcoming December 9 National Convention of the party. They include the former Governor of Ogun State, Gbenga Daniel; former Minister of Education, Prof. Tunde Adeniran; former Minister of Youth Development, Prof. Taoheed Adedoja; and former Lagos State PDP governorship candidate, Jimi Agbaje. Others are Prince Uche Secondus, a former acting National Chairman of PDP and Chief Raymond Dokpesi.